If you're worried about sweaty feet, HAIX® exchangeable, breathable insoles are quick drying and absorb perspiration from your feet so they are dry even under rigorous conditions. The built-in "AIRFLOW" channels help to keep your feet dry and comfortable all the time. They also provide just the right amount of cushioned support so you feel comfortable even when standing for long periods of time throughout the day. If you like your insoles clean and dry, you will find that the microfiber design is light and breathable as well as washable. Simply remove from your boots and wash in warm water (86° F) and allow to air dry. Order your moisture wicking insoles today as a replacement or so you have an extra pair on hand. Related links to "HAIX Insoles"
Customer reviews for "HAIX Insoles"
This is a great feeling insole right out of the bag. Put them in and it felt like a brand new boot. I just started wearing HAIX little over year ago. I just replaced my insole. The boots are the best I have every wore. I definitely recommend them to my friends. Thank you for taking the time to review our insoles. We are happy to hear that these are the best boots you've ever worn and that the insoles give you added comfort. We appreciate your recommendations and your loyalty to the HAIX brand! I recently replaced my medium insoles with the wide insoles to give my feet a little more room in my Black Eagle footwear and the difference was amazing! My shoes went from feeling just a bit tighter than I preferred, to feeling absolutely perfect! Can't wait to put a few miles on them! HAIX is the Firefighters choice! I've been wearing HAIX for years. I wear nothing else. Thank you for taking the time to review our insoles. 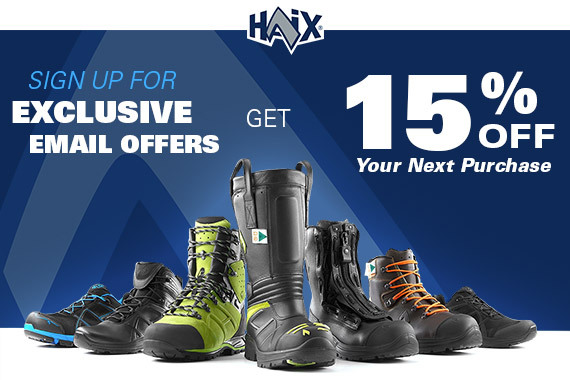 We appreciate your loyalty to HAIX for both boots and accessories. Thanks for being a longtime customer and for your service. The insoles fit perfectly and helped to rejuvenate my boots. My uppers and soles were in good shape and it did not make any sense to replace the entire boot but this was a great option. So happy to hear that you are happy with your new soles. We hope you will continue to be a customer in the future. service was fast and product was perfect.